If you want to see Madrid from a bird's eye view, take the cable car ("el Teleférico") that was originally built as part of the Parque de Atracciones amusement park. The journey starts on the Paseo del Pintor Rosales street, near the Argüelles Metro station, and takes you over the River Manzanares and into the Casa de Campo park. 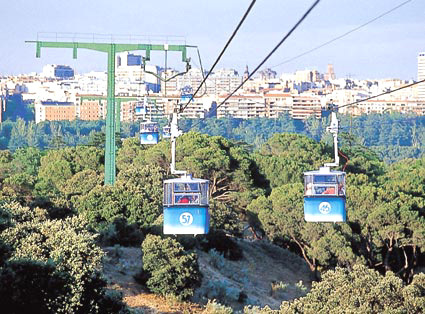 The cable car carries you above the city's parks and the Manzanares River in the distance, as a recorded commentary describes what you are looking at. You'll be seeing attractions such as the Plaza de España and the Egyptian temple of Debod from a completely different perspective, as well as taking photos from several other angles. Many of the city's famous sights may be seen, such as the Parque del Oeste Park with La Rosaleda (a 17,000-square-metre / 55,760-square-feet rose garden where annually in May a rose festival is held), the Torrespaña communication tower, the Royal Palace, Almudena Cathedral and the San Francisco el Grande basilica. The cabins reach a maximum height of 40 meters above the ground, and the entire 2.5-kilometer ride takes just over ten minutes from its starting point at the Paseo Rosales all the way to the Casa de Campo Park. At the end of the journey there is a restaurant and bar complex with even more views. There are 80 gondolas, each with a capacity of up to 6 passengers, and up to 1200 passengers per hour can be transported. The Teleferico runs every day from April to September and at weekends during the other months. IT generally opens at mid-day and closes sometime after 6pm - later in the summer. The exact days and times of opening may be found on the Teleferico website.